It’s a New Year, and it’s Still Organized! Happy New Year to all! May you have a year of amazing creativity and spark on your quilting journey, wherever you are on your path. I am going to wrap up the blog posts on Organization for now by summarizing some of the discoveries I made about myself – and how I use my room. Now that we’ve moved into January, some of you might find some interest in some of the lessons I’ve learned. It’s a good time to reinforce that organizing for quilters is a highly personal experience – so take what you like and leave the rest. The last big enhancement was the redo of the office chair on New Years Day. I bought it used on Craigslist a couple of years ago, and it was showing its’ age. I ran into a great deal on fabric to recover it…I’m happy! I will say that it took a lot longer than I expected it would. 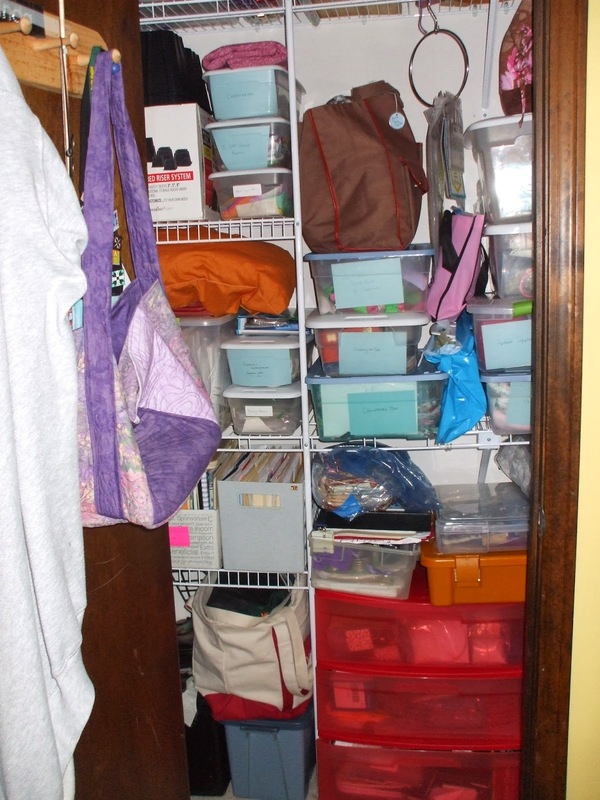 Now, in re reading the last two blog posts, I realize that it sounds as if I don’t utilize bins to store the stash – and that’s not totally accurate. It’s true that for me, it worked to take a lot (not all!) of the bins and empty them – or, more accurately, repurpose them. Here’s a before and after set of pics from my closet which illustrates the point. I now use bins to hold supplies/resources that I use in different stages of the quiltmaking process…finishing the top supplies, threadpainting supplies and references, machine quilting references, etc. I do keep 4 separate (smaller) bins for special fabric types – juvenile fabrics, cotton precuts (I have found that most of what i have saved is in 2 and a half in strips, and 5 inch squares), batik precuts (same dimensions), and solid fabrics. The solid fabrics came about because I belong to a guild which is hosting a solid challenge this spring – so it made sense to me to keep them where I could find them. I also put all my ‘jelly roll’ style of patterns into one section of my bookcase. This irks me because I went to a trade show with a shopping list (something else that will be easier to do now! ), and I still came home with a dupe. Fortunately, it was only one….but I’m going to have to do a LOT of purple quilting to use this all of this thread! Thats it for now…I’m working on the desk portion of the office now (and I have discovered a tool that is awesome for file organization)…I just want to work with it for a bit longer before I say anything, but it looks like all the paperwork in my office has a home…I know, what a concept. I’d love to know whether this has been helpful to you in organizing your space. Email me at Linda@thepatchworkpearl.com if you have any more questions. Oh, and it’s a good thing to always leave room for growth…I do have one bin that’s needing to be filled…and soon! The bin I left for the Downton Abbey fabric from Andover Fabrics…it’s a double wide! ← Is it Organized or is it Camouflaged?